To start, what is glucose? Put simply, glucose is sugar that provides energy to the body. 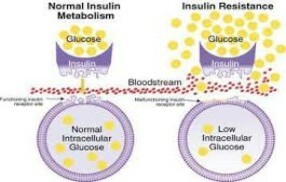 The body is able to turn glucose into energy by means of a hormone called “insulin” that is produced in the pancreas. Insulin is released when blood sugar levels rise, and they enable the glucose to go into the body’s cells where they can be used for energy. Obviously the body needs enough insulin in order to keep blood sugar levels in check; otherwise they would get out of control. However, too much insulin can be just as bad for the body. The problem arises because insulin is also responsible for turning unused energy into fat, as well as preventing existing fat from breaking down. On the other hand, when the pancreas releases too little insulin, people can become extremely thin and do not gain weight no matter how many calories they eat. This sounds perfect, right? Wrong! This can be very dangerous to your health, and you will be left feeling tired and out of energy the whole time. Apart from tipping the scale to the extremes on both side, if your insulin levels are not properly managed it can lead to many other dangerous health issues like inflammation, coronary heart disease, stroke or even cancer. You can use all the medication in the world, if you do not fix your lifestyle habits first, it will remain a constant battle. You should get plenty of exercise, drink enough water and follow a healthy diet made specifically to keep blood sugar levels balanced.